Meets visibility regulations for physical training on military bases. Both reflective and luminous, this Belt is a one-stop solution to stand out in low-light, low-contrast situations. A smart investment for runners, joggers, biking, or just walking the dog. Snag yours before your next early-morning dog walk. Make your move! 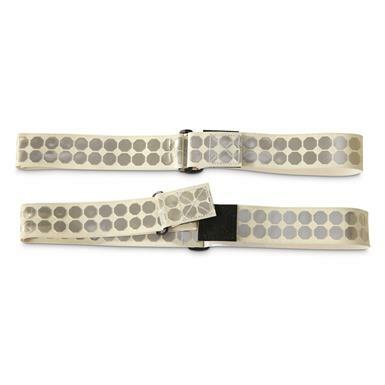 U.S. Military Surplus Reflective Belts, 2 Pack, Used is rated 5.0 out of 5 by 1. Rated 5 out of 5 by Gary from Bargain price and brand-new condition Great reflectivity and price. Product Details state these are "used" but both were in brand-new condition. I would highly recommend for runners/walkers or roadside repairs. You can also hang these to mark dark campsites.